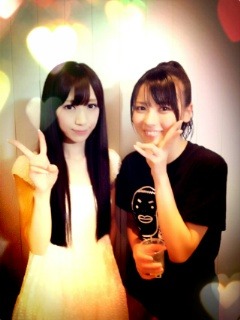 Yukafin from Afilia SAGA tweeted this 2-shot she took with Maimi at “FES IWAO SUMMER 2012”, and wrote that she was glad she could appear with Maimi. BiS member Terashima Yufu posted this 2-shot with Maimi in an update on her official blog, and wrote that Maimi has always been her favorite ever since ℃-ute’s formation. The website Visual Web S has started a feature on Maimi and Suzuki Airi for the month of September, and though you have to pay to get access to all the photos, the website offers several high-quality samples. A press conference for the recently announced “CAT’S♥EYE” play was held today at Asakasa Sacas, which MANTAN WEB again reported on. More details of the play were revealed, including that the the three main roles would be played by Maimi (“Hitomi”), Sudou Maasa (“Rui”), and Hagiwara Mai (“Ai”). All of the Berryz Koubou and ℃-ute members will have the same roles in both versions, which will tell the same story from two different perspectives: “To steal” (A version) and “To be stolen from” (B version). In addition, a special unit consisting of the Berikyuu members in the play, “CAT’S♥EYE 7”, has been formed for the duration of the play, and performed a remake of the “CAT’S♥EYE” theme song at the event. A gallery of 26 images can be seen at the MANTAN WEB article. Maimi will be appearing alongside Berryz Koubou and ℃-ute members in the upcoming play “CAT’S♥EYE”, based on the popular Shounen Jump manga from the early 80s, according to a Mantan Web article. The play will be the 12th installment of the “GekiHaro” series, and feature Berryz Koubou members Shimizu Saki, Sudou Maasa, Kumai Yurina, and Sugaya Risako, and Maimi, Nakajima Saki, and Hagiwara Mai from ℃-ute in two different versions. Performances will run from September 22nd to the 30th at the Ikebukuro Sunshine Theater in Tokyo, and on October 13th and 14th at the Ion Keshouhin Theater BRAVA! in Osaka. The JIJIPRESS YouTube channel uploaded a video report on Berikyuu’s “Chou HAPPY SONG” event held at Tokyo Dome yesterday. The members participating in the Tokyo event were Maimi, Tsugunaga Momoko (Berryz Koubou), Sudou Maasa (Berryz), Sugaya Risako (Berryz), Okai Chisato (℃-ute), and Hagiwara Mai (℃-ute). The video includes short clips of the girls performing Berryz’s “Because happiness”, ℃-ute’s “Shiawase no Tochuu”, and then the Berikyuu song that comes from combining the two songs, “Chou HAPPY SONG”. 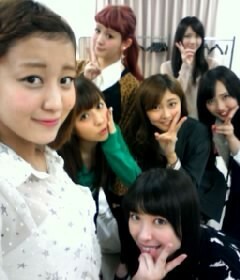 Also shown is a corner from the event where Maasa asked each girl to show their favorite pose from the choreography for “Chou HAPPY SONG”. Maimi chose the part of the dance where they hug each other, but Mai revealed that until recently Maimi always forgot to hug her. 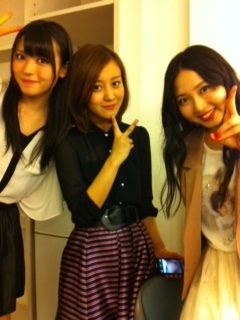 Momoko then goaded Maimi into apologizing to Mai, which she did by mimicking Momoko’s catchphrase “Yurushite, nyan!”. In a backstage intervew segment, Maimi asked each of the members what was something that makes them “super HAPPY” recently. Maimi herself answered first, explaining that she really loves sweets and lately she becomes super happy when she has waffles with ice cream on them. After sharing all their answers, the girls wrapped up the video by promoting the upcoming Hello! Project summer tour and the Berikyuu photobook “Rival”. Maimi, fellow ℃-ute members Hagiwara Mai and Okai Chisato, and Berryz Koubou members Shimizu Saki, Sudou Maasa, and Kumai Yurina recorded some comments on Berikyuu’s brand new single “Chou HAPPY SONG” for the website Kawaii girl Japan. In the English-subtitled video, the girls are asked their thoughts on the song, each others’ groups, and which songs made them happy as children. Maimi, Captain, Maasa, and Mai returned for a third week of canned food study under the tutelage of canned foods expert Kurokawa Hayato on the “Extracurricular Lesson” segment of Bijo Gaku (aired on 3/17/2011), which immediately began with another quiz this week. Kurokawa showed the girls a can of “mentaiko” (walleyed pollack roe) called “Mentai Can”, and asked them to tell him what kind of fish mentaiko comes from. After a couple of incorrect guesses from the other girls, Captain asked Kurokawa for a hint. For the hint, Kurokawa pointed out the character on the can (Taizoo-kun) and read his profile, which contained information on his age (28) and hobbies (surfing, karaoke). As that hint clearly didn’t help any, Kurokawa offered another one, first telling the girls that the fish is called “_______dara”, and then “su_____dara”. With that hint, Maimi was able to correctly guess “suketoudara” (walleyed pollack) and won a bowl of mentaiko on rice. Captain asked Kurokawa what he was going to do with the remainder of the mentaiko, to which he replied that he was going to eat it himself afterwards. 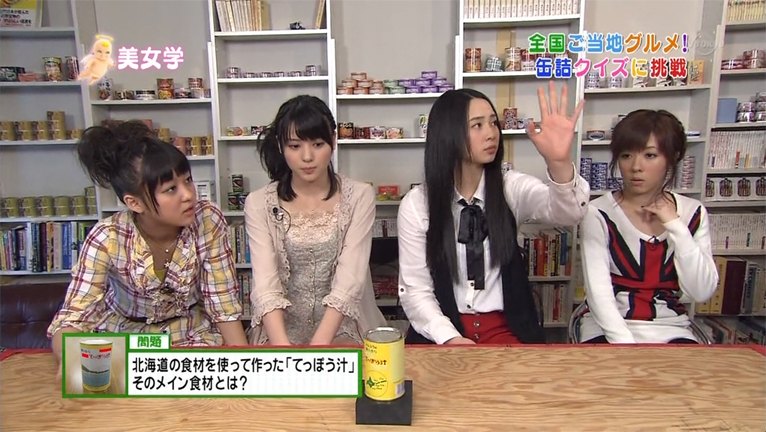 For the next quiz Kurokawa brought out a can of “Matsusaka-gyu WHAT’S Curry”, a high-grade beef curry which is made from meat that is boiled for 3 days, and asked the girls to guess the price. Before the girls wrote down their answers, he offered the hint that each 810 gram can has 4 servings in it. With that in mind, Captain guessed 1980 yen, Maasa guessed 2200 yen, Maimi guessed 3500 yen (citing the luxury of the long cooking process as the reason for the high price), and Mai guessed 2400 yen. Kurokawa revealed that someone had guessed the price exactly, and it was Mai with her guess of 2400 yen. While enjoying her plate of curry, Mai feigned like she was going to share a spoonful with Maimi, but quickly pulled it away and ate it herself. Maimi commented that Mai pulled the spoon away too fast, though, as she hadn’t even opened her mouth yet. Kurokawa had one more special canned food and rice dish to teach the girls about, and for that he took out a can of SPAM. Upon seeing the can, Maimi revealed that she really loves SPAM and has it in the morning for breakfast. Kurokawa then showed the girls how to prepare “SPAM and tuna Italian donburi”. The first step is to make a spread by mixing together tuna, anchovies, and mayonnaise. Then you spread it on top of a piece of SPAM and add black pepper and soy sauce. Kurokawa placed the SPAM on top of the bowl of rice with a “DON!” (the Japanese onomatopoeia for a loud thud), and Maimi tried to make a pun by saying “SPAM don” (“don” being short for “donburi”, a bowl of rice with food on top). Like the weeks prior, the girls had to battle it out in a series of Rock-Paper-Scissors matches to see who’d be the lucky three to try the “SPAM and tuna Italian donburi”. The first winner was a jubilant Maimi, who avoided repeating her fate from last week by beating the three others’ paper with her scissors. Captain won the face-off with Maasa and Mai and secured a bowl for herself, leaving Maasa and Mai to battle each other for the final bowl. A nervous Mai tried to gather her composure, but ultimately lost to Maasa’s rock versus her scissors. As if being excluded from the meal wasn’t enough, Kurokawa then asked Mai to hand everyone the chopsticks that were next to her. Mai watched on with teary eyes as the winning girls sampled the SPAM donburi, and Maimi commented that the combination of flavors was really delicious and that she was really happy. The canned food “Extracurricular Lesson” series came to an end with Kurokawa asking the girls to try to apply what they learned there at their homes, and with the girls thanking Kurokawa.